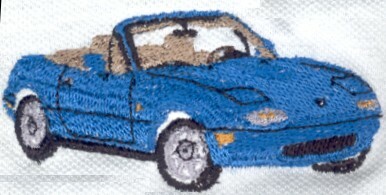 We're proud to offer embroidered apparel celebrating the world's most successful sports car, the Mazda Miata MX-5. 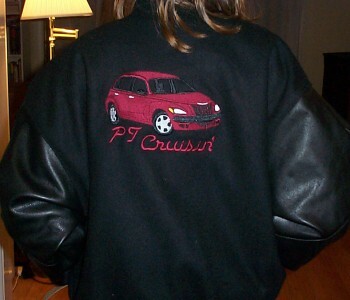 Available on a variety of shirts, jackets and caps, each item is stitched to order so you can select the style, size and color of apparel that you want, with the car embroidered in your choice of factory or custom colors at no extra charge. For a slight additional fee, we'll also personalize your shirt or jacket with your name or with your club's name or event. These are our own original designs, digitized for detail and realism. Instead of creating one large color block for the body and then using detail stitching to imply body contours, each major styling element is created separately and the stitch angle adjusted for maximum 3D effect. You can now get our designs stitched 8" wide on the back of any of our jackets. See below for details. 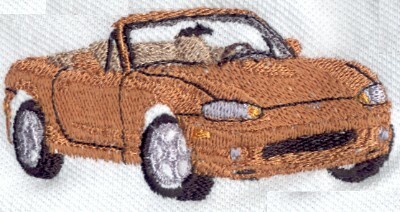 (Yes, I know that isn't a Miata, but it gives you a good idea of the scale of the embroidery). Tee Shirts are available in sizes S thru XXL (sorry, no tall sizes). Short sleeves are available in 35 different colors. Long sleeves are available in 8 different colors. We use 100% cotton, heavyweight shirts, with double-needle stitching and 'taped' neck and shoulders. Short sleeve tees are $20 each for sizes S - XL. $21.25 for XXL. Plus shipping. Long sleeve tees are $22 each for sizes S - XL. $23.25 for XXL. Plus shipping. Golf shirts are available in sizes M thru XXL. Golf shirts are 100% cotton (except for heather grey: 90/10), 6.8 oz. preshrunk pique knit, with knit collar and welt cuffs, 3 button placket. The short sleeve golf shirts are $25 each for M-XL and $27 for XXL. Ladies styles are $27 each for S-XL. Plus shipping. The long sleeve golf shirts are $28 each for M-XL and $30 for XXL. Plus shipping. 100% garment washed cotton, unstructured six-panel low-profile cap. Fabric strap size adjuster w/ brass buckle and sewn slot. Matching undervisor. Available in White, Khaki and Black. Baseball caps are $19.00 each. Plus shipping. 13.5 oz., 100% polyester no-pill therma® fleece quarter-zip pullover with side-seam pockets. Two-piece collar with black tricot binding and black polyester no-pill fleece. Elastic cuffs and waistband. Available in sizes S thru XXL. Click here for image of pullover and colors. The Thermal Fleece Pullovers are $45 each for M-XL. XXL are $50 each. Plus shipping. 100% cotton, enzyme-washed jacket w/ blue denim body and contrasting twill sleeves. Matching cotton twill lining w/ inside pocket. Antique brass snap closures. Knit collar, cuffs and waistband. Side slash pockets. Available in sizes adult Small thru XXL. The Denim Jackets are $65 each for M-XL. XXL are $70 each. Plus shipping. New Jacketbacks: Denim Jackets with a large 8" embroidery on the jacket back plus the standard left breast embroidery are $90 each for M-XL. XXL are $95 each. Plus shipping. 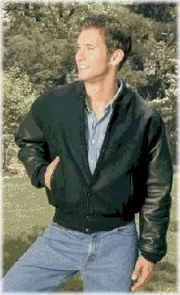 We offer a selection of varsity jackets, both imported and US made, so you can get the jacket you want. 18 oz., 100% wool jacket. Quilt lining with inside pocket. Outside slash pockets. Ribbed collar, cuffs and hem. Imported. Available in sizes S-XXL. Our 100% wool varsity jacket is $125 each. Plus shipping. New Jacketbacks: 100% wool varsity jackets with a large 8" embroidery on the jacket back plus the standard left breast embroidery are $145 each for M-XL. XXL are $165 each. Plus shipping. 18 oz., 100% wool jacket with natural color suede sleeves. Antique brass snaps. Quilt lining with inside pocket. Outside slash pockets. Ribbed collar, cuffs and waistband. Available in sizes S-XXL, in black, navy and forest. Our varsity jacket with natural suede sleeves is $200 each. New Jacketbacks: varsity jacket with natural suede sleeves with a large 8" embroidery on the jacket back plus the standard left breast embroidery are $225 each for M-XL. XXL are $240 each. Plus shipping. 21 oz., 100% melton wool jacket with leather sleeves. Antique metal snaps. Quilt lining with inside pocket. Outside slash pockets. Ribbed collar, cuffs and waistband. Available in sizes S-XXL, black/black and mocha/mocha. Our imported varsity jacket with leather sleeves is $200 each. Plus shipping. New Jacketbacks: imported varsity jacket with leather sleeves with a large 8" embroidery on the jacket back plus the standard left breast embroidery are $225 each for M-XL. XXL are $275 each. Plus shipping. Premium melton wool jacket with premium 'soft touch' leather sleeves. Antique metal snaps. Quilted lining with inside pocket. Outside slash pockets w/ leather trim. Ribbed collar, cuffs and waistband. Union made in USA by Reed Sportwear. Available in sizes S-XXL, black/black and navy/navy. Our premium US made varsity jacket with leather sleeves is $225 each. Plus shipping. New Jacketbacks: premium US made varsity jacket with leather sleeves with a large 8" embroidery on the jacket back plus the standard left breast embroidery are $250 each for M-XL. XXL are $275 each. Plus shipping. Soft Nappa leather. Action back w/ center vent. 'Stay and Lay' collar. Zip-out Thinsulate insulated lining. Inside pocket. Available in sizes 36-50 and 40L-46L in black and brown. Inquire for larger sizes. Imported. Our 'Classic' leather jacket is $250 each. Plus shipping. New Jacketbacks: Our 'Classic' leather jacket (imported) with a large 8" embroidery on the jacket back plus the standard left breast embroidery are $275 each for M-XL. XXL are $285 each. Plus shipping. Top-grain Nappa leather. Action back. Zip-out Thinsulate insulated lining. Inside pocket. Available in sizes S-XXL in black and brown. Inquire for larger sizes. Made in USA by Reed Sportswear. Our Premium leather bomber jacket is $350 each. Plus shipping. New Jacketbacks: Our Premium leather bomber jacket (made in USA) with a large 8" embroidery on the jacket back plus the standard left breast embroidery are $375 each for M-XL. XXL are $385 each. Plus shipping. Please be advised that specifications may change without notice. Our vendors use a variety of suppliers and sometimes they change things without notifying us. Miata, Mazda and MX-5 are Registered Trademarks of Mazda Motors Company and Ford Motor Company. Rokem Needle Arts and Tshirts are not affiliated with Mazda Motor Company or Ford Motor Company. The products on this web site and sites linked to are not necessarily that of the Mazda Motors Company or Ford Motor Company. © 2004 - Rokem Needle Arts. All rights reserved. You are Miata lover # to this page!